Amis Gizmo, a front-running winner of four added-money events as a juvenile, switched it up to come from off-the-pace and capture Sunday's co-featured $150,000 Plate Trial Stakes, at Woodbine. 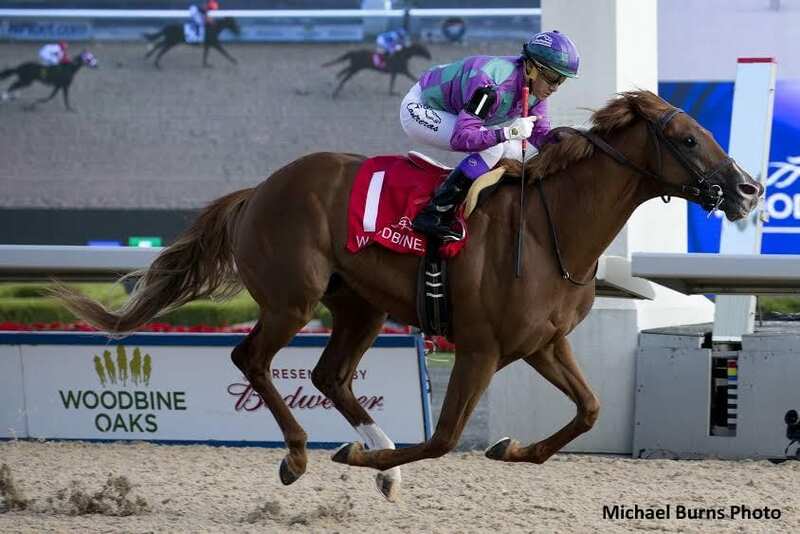 Trained by Josie Carroll for owner-breeder Ivan Dalos, Amis Gizmo won the Simcoe, Bull Page, Frost King and Kingarvie Stakes under regular pilot Luis Contreras last season. The Giant Gizmo chestnut arrived at Sunday's 1 1/8-mile Tapeta route, the final major prep for The Queen's Plate, from a fifth-place run in the Wando Stakes. Sent to post as the 5-2 second choice in the Plate Trial, Amis Gizmo would not disappoint with a sparkling return to form that will see the colt the likely favourite in the Gallop for the Guineas, slated for Sunday, July 3. Conquest Cavalry, with Gary Boulanger up, set a quick tempo in the Plate Trial marking off splits of :23.98 and :48.16 as Shakhimat, sent to post as the 4-5 mutuel favourite under Emma-Jayne Wilson, tracked his early foot. Contreras, from the inside post, was content to settle Amis Gizmo into fourth position. Wilson and Shakhimat attacked the pacesetter through the turn and emerged with the lead as Amis Gizmo rallied outside of rivals to engage. Shakhimat battled gamely but Amis Gizmo, full of run, surged to a 2 1/2-length score. Shakhimat stayed on for place, 1 3/4-lengths in front of Sir Dudley Digges who rallied gamely for show money. Amis Gizmo covered 1 1/8-miles in 1:52.12. Contreras was pleased with the trip he engineered for Amis Gizmo. Wilson tipped her cap to the winning horse. “We had a real nice go. He switched off real nice and moved along well down the backside. We moved into good position around the turn and I could feel the pressure coming down on him around the turn. He fought hard but he just got beat by a better horse today,” said Wilson. Dalos was thrilled with the improved performance from his Plate prospect. Amis Gizmo, bred in Ontario by his owner, banked $90,000 in victory while improving his record to five wins from six starts. He paid $6.80, $2.80 and $2.50, combining with Shakhimat ($2.50, $2.10) for a $13.20 (1-2) exactor. A 1-2-6 triactor (Sir Dudley Digges, $3.10 to show) was worth $67.10. This entry was posted in Racing and tagged amis gizmo, Emma-Jayne Wilson, josie carroll, Luis Contreras, Plate Trial, queen's plate, queen's plate trial, shakhimat, woodbine by Press Release. Bookmark the permalink.